We are a leading Manufacturer of iol delivery system from Chennai, India. 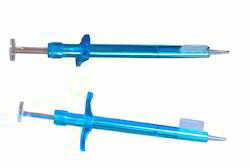 GLOJECT single use injector system is specially designed for smoother and safer delivery of acrylic foldable IOL. Gloject injector system delivers the IOL from 1.8 mm to 2.8 mm incision cartridges.Click-lock mechanism thereby securing the lens in the exact position for a perfect lens delivery into the eye. Gloject injector and cartridge sterilized by ethylene oxide. Looking for Injector and Cartridge System ?